Martin Luther King, Jr. Sunday. What we just heard was the ending of the sermon Dr. King gave on the third of April, 1968 at Mason Temple in Memphis, the eve of his assassination. His words, of course, are eerily prophetic of his own demise. They are also filled with gratitude to God for having allowed him to do His will—for having allowed him to go up the mountain to see the Promised Land. To peer into the future. As we excitedly anticipate the inauguration this Tuesday of the first black president of the United States of America, I have been wondering if this promised land that Dr. King saw, but knew he wouldn’t live long enough to reside in—this promised land where there would be equality and justice for his people, black people; if we are now living in that land. Does the election of Barack Hussein Obama, a man with an African father and a white mother, to the highest office in the land, thus making him the single most powerful person in the world, mean that African Americans have reached the promised land of equal opportunity and citizenship? I don’t know the answer to do that. I only know that something momentous has happened in our country, our country established on the premise that “all men are created equal,” a premise that was slow to be put into practice, as in reality it referred only to white males and then only if they were property owners. The process to bring about equality for all Americans has been a slow and arduous one, one filled with intimidation and death, hopes and dreams destroyed by the tyranny of injustice and economic violence. We have gotten as far as we have because this “forming of a more perfect union” was envisioned by the writers of the Constitution as an ongoing process. Provisions were created so that laws could be made in response to the then unknown, but anticipated cultural changes which would come with time. The Constitution is not static, but is vibrant and living in the same way that the Bible is a living document which can be reinterpreted in response to cultural change and enlightenment. Revelation is ongoing. Truth evolves. Change happens. In the poem read earlier in the service, Tony Hoagland writes about how change happens no matter what, and, no matter what, changes us. We can resist it or we can surrender to it, allowing ourselves to be transformed. When I first read this poem I felt a bit of unease—that discomfort of seeing a white guy side with another white against a person of color. I felt a bit indignant—“How could he do that?” However, being a good poem, we’re supposed to feel that way—we’re forced into the writer’s shoes in order to feel and see what he feels and sees. I resisted. “I’m not like that!” “I’d never do that!” But he’s exposing himself to us. How brave, admitting that he identifies, at least in that moment, with those of his own race; admitting his fear of the strong and intimidating black woman who is tromping the white girl at tennis. What is most amazing is that we experience with him his growing awareness that something had changed in the world in that moment; history passed him by so close he could smell its breath and could reach out and touch it on its flank. I don’t presume to know what a man or woman of color who reads this poem would feel; I only can, from my own social location as a white male, know how it affects me. However, I think that all of us, no matter what our race, experienced something similar to what the poet did watching the tennis match when we sat in front of our televisions on the evening of Election Day and heard President-Elect Obama say in his Grant Park victory speech: “If there is anyone out there who still doubts that America is a place where all things are possible; who still wonders if the dream of our founders is alive in our time; who still questions the power of our democracy, tonight is your answer.” I sat on my couch hearing his words and felt history pass me by so close I could smell it. Change. Change. CHANGE. I, like many of you, cried tears of joy, amazed at how much our country had changed in such a short time. But, of course it wasn’t really such a short time. The first enslaved Africans were brought to this country in 1619 and the Emancipation Proclamation wasn’t issued until 1865. That’s 246 years between those two events. It would be another 99 years before the Civil Rights Act of 1964 outlawing segregation and Jim Crow was passed and 45 more years until Inauguration Day, 2009. Think of all that happened in those years that made electing a black American possible. All the suffering. The degradation. The courage and hope. Think of all those people who fought for racial justice. The protests and civil disobedience. All those people who sacrificed their lives in the quest for justice. At an Obama rally in Cleveland last year, the rapper J-Z said, “Rosa Parks sat so Martin Luther King could walk. 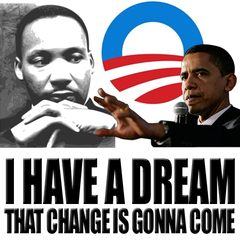 Martin Luther King walked so Obama could run. Obama is running so we all can fly.” We all can fly. WE. For until all of us are free, none of us is free. J-Z connected the dots of the modern civil rights movement paying homage to two of its towering figures who had made it possible through their work, their courage, their sacrifice, for a black man to become president of the United States. Of course, there were untold others who helped pave the way, many well-known, but most, nameless and unremembered. In Dr. King’s I Have A Dream Speech which we heard in a remix at the top of the service, Dr. King said, “I still have a dream. It is a dream deeply rooted in the American dream that one day this nation will rise up and live out the true meaning of its creed—that we hold these truths to be self-evident that all men are created equal…that my four little children will one day live in a nation where they will not be judged by the color of their skin but by the content of their character.” President-elect Obama, as one of Dr. King’s metaphorical children, was able to be judged on the quality of his character rather than the color of his skin. Or was he? Throughout the presidential campaign, especially after the Democratic National Convention, Obama’s political advisers downplayed the role of race in the election, but in reality were working behind the scenes to win over white voters without alienating black ones. Race did matter in the presidential campaign. In his so-called “race speech” given in Philadelphia last March, Obama commented on how at various stages of the campaign some commentators deemed him either “too black” or “not black enough;” how the media scoured every exit poll for evidence of racial polarization. In his Iowa Caucus victory speech Obama said, “You know, they said this day would never come. They said our sights were set too high. They said this country was too divided, too disillusioned to ever come together around a common purpose. We are choosing hope over fear. We’re choosing unity over division.” Pointing out, without naming it, that fear of otherness—of blackness—would not allow whites and blacks as well as Latinos and Asians and Natives Americans to work together on a common goal, but that in Iowa, people of all races worked in unity with one another for the greater good. Now, you know, race is a rather new mutation in the genetic heritage of us humans. There is only 5% genetic variation among us, no matter what our race, a fact which leads some theorists to believe that race is a social construct rather than a biological one. No matter. In our cultural and political history race has been a differentiating factor, a divisive and polarizing one; one in which one racial group has had power over another. Today in our multi-cultural society, race is much more fluid; one can choose for oneself one’s racial and ethnic identity, especially the growing number of Americans who are of mixed race. President-elect Obama is black because he says he’s black. He’s black because he identifies with his black heritage and the black community. In his book, The Luminous Darkness, published in 1965, Howard Thurman wrote that “the burden of being black and the burden of being white is so heavy that it is rare in our society to experience oneself as a human being.” Perhaps the election of a black to the presidency has helped to lift this burden for blacks. So, too, it may be but a beginning, a demarcation between a multi-racial and multi-ethnic culture to one that no longer uses race and ethnicity as cultural markers of identity, unless one chooses to. We will not suddenly become color blind, but we will look beyond race and ethnicity to what lies deeper within each of us, and our communal identity will be based on shared values and interests rather than shared genetics. This has already happened; we are already a multi-cultural society, due in large part to the ascendancy of hip hop. Hip hop not just as a musical genre but as a way of life, a way of seeing the world. Hip hop is a trans-global phenomenon, one in which young people everywhere listen not only to American artists, but those from their own countries who utilize their own cultural indicators using their local vernacular. Hip hop is a world-uniting, culture-spanning, and generation-uniting movement that presages what a post-racial culture might look like. Historically, black culture and music was appropriated by the white corporate media to make it palatable for mainstream cultural consumers. Think Elvis Presley. But hip hop does not accommodate itself to the traditional white music industry. It exists on its own terms making no concessions to other sensibilities and in the process makes fortunes for its artists, promoters and producers while transforming the cultural landscape of the entire world. There is practically nowhere on the face of the earth where hip hop isn’t. And no doubt there will be–already are–other culture and art based movements that will unify the people of the world, bringing about something which governmental bodies and religions have been unable to do: a world community with peace, liberty and justice for all. During the campaign there was much discussion about whether or not we are moving beyond race, that we are, as a culture, post-racial. In response to this, Cory Booker, the black mayor of Newark, New Jersey said, “God forbid if we ever get to a point where we transcend our race.” In an election night interview with MSNBC he said, “I want to luxuriate in the racial deliciousness of our country: the Italian-Americans, the Irish-Americans, the Mexican-Americans…That’s what makes America great. We are a nation that celebrates racial diversity…The story of America is one of bringing such differences together to manifest a united set of ideals—not a united culture, not a united language, not a united religion, but a united set of ideals.” I concur. But as a multi-cultural, multi-racial, multi-religious country we have work to do. And much of that work is around racial reconciliation. White America must admit that racism exists. In survey after survey researchers find that white Americans don’t believe that racism is much of a problem while black Americans believe that it is; know that it is. The privilege of whiteness is so embedded in our culture that most whites are unaware of it. But make no mistake, blacks and other people of color are very aware of it and any abuse of power by whites who are in authority or form a majority in a governing body will be construed as racist. and the new president proves that he’s a dummy. like she wasn’t asking anyone’s permission. “The Change” by Tony Hoagland, from What Narcissism Means To Me. © Graywolf Press, 2003.